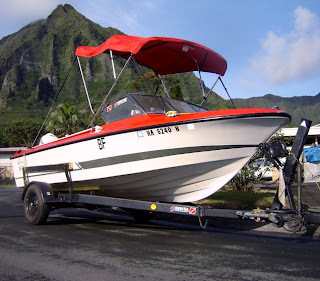 A big mahalo to our new sponsor, Bayside Marine Service for repowering our Red Sea Boat with the fuel efficient Envirude E-tec outboard motor. After over 30+ years of sucking gas and having a empty pocket at the end of the day we are looking forward to using the hottest engine on the market today! 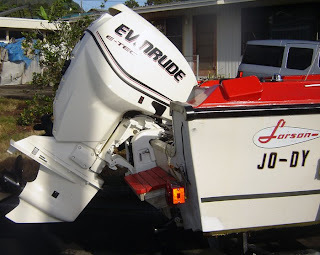 If you are interested in the Evinrude E-tech motors, call Paul at 247-1202 and he will hook you up! 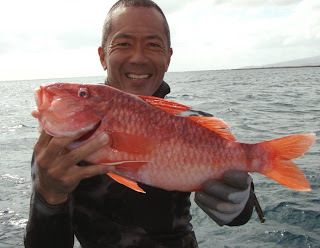 Saint Patrick's Day was pretty productive as Kevin Sakuda of Hammerhead Spearguns invited Kurt Chambers, James Oshiro, and myself for a day trip to Molokai. 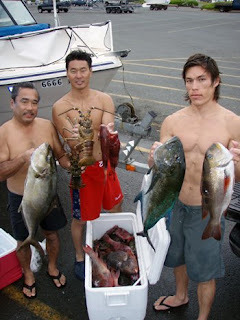 The winds were variable and no swells in sight so we made the 2 hour ride over pretty easy. 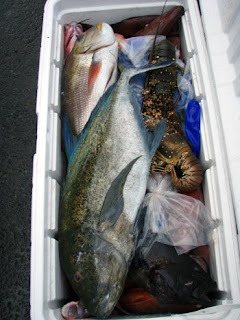 Reef action was the call with a mix bag of goats, uhus, mus, jacks, and even a few bugs. The water was a little dirty for filming but got a few shots anyways. Weather looking a little windy with small surf for the remaining half of the week into next week so I better start working on some trips.